Machete has been around us for a very long time. Machete-like tool was dated back to the Bronze Age. Probably one of the most important tools of all time. It can be used for day to day works in farming, but at the same time can also be used as a weapons. Selecting the best machete can be a complex task. There are many variations of machete. Each has its own purposes and benefits. A well-known brand. The machete has been field tested and approved by many. 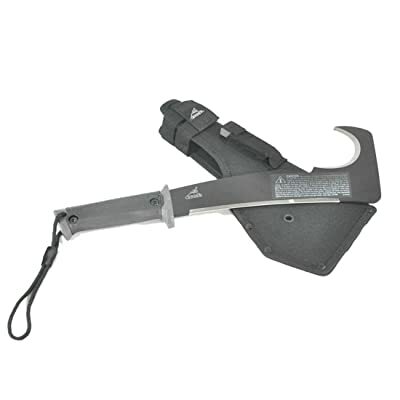 It is perfect for cutting down weeds, cleaning camping site or chopping branches. For user comforts, the handle is ergonomically shaped with Kraton G thermoplastic elastomer with a non-slip grip. Using the Kukri for a long time will be more enjoyable. The Kukri machete measures 17 inches in total with 11.5 inch blade length. The weight for the machete is only 1.7 lb. not bad for a heavy duty machete. An ancient classic machete has a very long history in term of its design. The Gladius Machete design is derived from the sword used by Celtic tribes of ancient Iberia (Spain) and adopted by the roman Legions. The machete is fairly long. 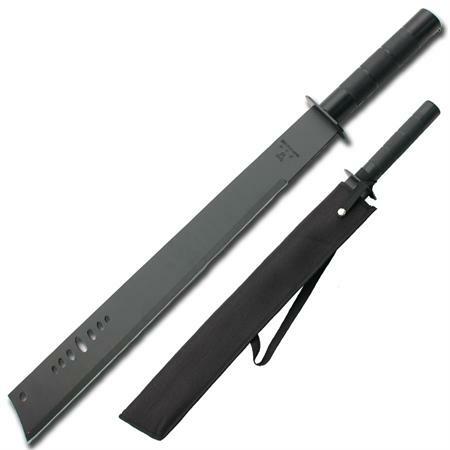 Its total length is 26-7/8 inch and the blade length of 19 inches with 2.8mm thickness. The blade is made from 1055 carbon with anti-rust matte finish. The handle is designed for heavy beating. The handle is made of polypropylene, a very durable plastic. The Gerber 31-000705 Gator Machete Pro is a true multipurpose machete. We can use it as an axe or as a tree cutter, but still deliver comfortable use. The machete is designed for strength, corrosion resistance and ease of sharpening. The gator grip is also very unique and comfortable for use. 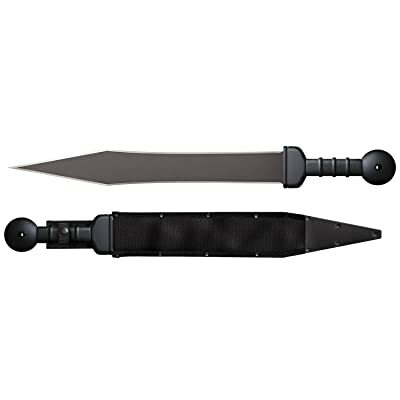 It has 10.5 inches total blade length and weight only 17.9 ounce and made from high carbon steel. The Kopis machete is modeled closely on an ancient design from Greek and Roman. The unique shaped blade provide extra chopping power. Yet it still capable of retaining its sharpness. These features are very useful for our needs. This model is equipped with a traditional semi-D ring guard reinforced through by the steel tang as and added safety feature. Its blade length is 19 inches with 7 inches for the handle. The blade thickness is only 2.8 mm. Whetstone Cutlery Brut Super Machete is designed for Survival tool. 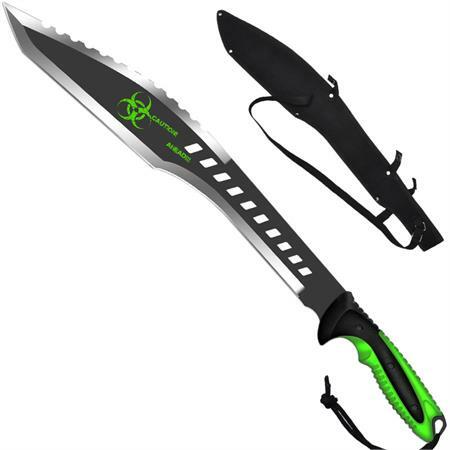 It is a heavy duty machete with numerous survival features. The blade is made of stainless steel with the total length of 22.75 inches. the blade has saw-tooth back with cord cutter slot. A handy features that we should appreciate. The handle is made from Pakkawood with additional straps and we can hold with one or two hand. The Brute is one machete that will last a lifetime a true Super Machete! Before we can select the right machete, we need to be clear on our purposes. Machete for cutting small tree will definitely be very different from the one that we need for camping. For hacking purposes we will definitely looking for material that heavy enough so it can cut off small tree in a single swing. Heavy and durable material will be the best selection. For camping on the other hand require a lighter blade, so it will not a burden when we have to track our way to the camping ground. To simply the process, we lay out the most important criteria for your consideration. Thre are many variation of machete. Each has its own purposes. Barong is originally coming from certain tribes in Philippines. The machete is the main weapon for the native people. And it has proven to be a deadly weapon in wars against the European colonials. Its thick and leaf-shaped blade can produce a deadly result. A perfect combat weapon. The billhook machete has been using in the agriculture for long time. The unique curved-end make is perfect for chopping vines, shrubs and branches. The design also allows better stripping shoots and buds from the main trunks. Bolo is another machete that is suitable for agriculture works. It is popular in South-eastern Asia. The bolo design provide additional chopping power, well suit as a harvesting tool. Historically bolo has being used as a combat weapon during world war II. Bowie was popularized by the American Jim Bowie, and the machete is still popular till to day. The tip of the blade is very pointed and sharp, which allow for piercing. A perfect tool for those who love finding adventure in the woods. The Latin bush machete is designed to be evenly weighted and very strong. 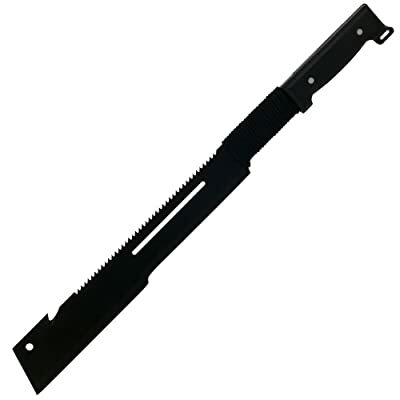 It is a multipurpose machete that can be carried around easily. The machete is well suit for green vegetation, a perfect tool if you are going into a thick jungle. The cane machetes is designed for agriculture purposes. It has a heavy and blunt-tip that hack sugar cane or any other vegetation effortlessly. 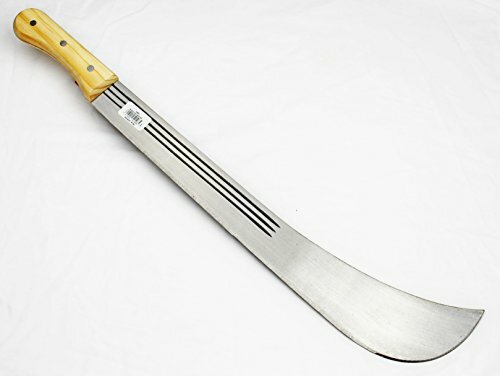 One of the reason why we can easily find this type of machete in sugar cane farms. It also has variation of name, but the design is almost the same. Coping machete has a blunt-tip. This allows the tool to be used in a tight spaces, especially during a rescue mission. Golok originated from Southeast asia. Traditionally it is used as an agriculture tool. 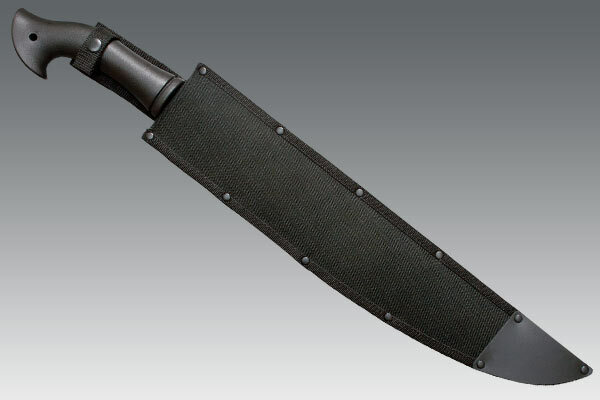 Golok tend to have thicker blade, so it can cut vegetation easily. However the sizes and weight of golok may varies. Hawkbill machete has a very prominent curve at the end of the blade. Normally both side of the blade will be sharpened. Its curve blade is perfect for cutting thick vegitations. A good reason why hawkbill is a perfect grass cutter. Kukri originates from central Asia (Nepal, India etc). 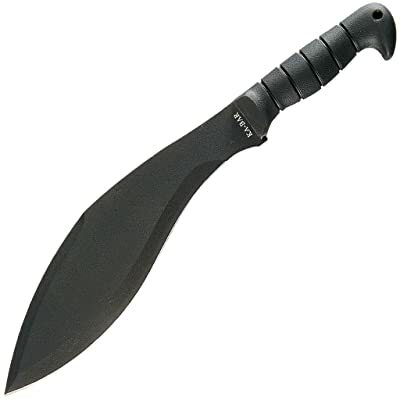 until today Kukri is one of the standard tool for Ghurkha army. 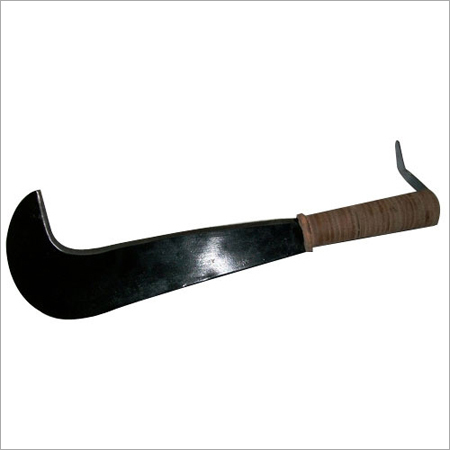 In its own native country, Kukri is a commonly used for agriculture tool. 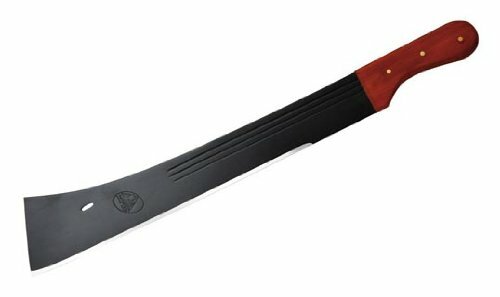 Due to its unique design the machete is suitable for various function like stabbing, chopping and whittling. Panga is widely used in Africa and the Caribbean. Its wide front end provide a powerful chopping forces, perfect for chopping thick vegetation. At the same time its blade also perfect for slicing. The panga upturned point can be used for piercing. Parang is still widely used in Southeast Asia. It has a more thicker blade. Perfect for cutting thick vegetations. Parang is a must if want to explore the tropical junlges. The main design of the Tanto is for piercing enermy armor. It has strong and pointy shape. Definitely perfect for combat purposes. Tapanga is very popular in Africa and Caribbean. The machete has a fairly blunt and heavy blade. This make it very suitable for chopping works. Tapanga is a general purpose tools. The most important part of machete is the material for blade. The metal is the heart of the blade. So when selecting a blade, again, we need to consider the most suitable metals. In general we can category the metal for the blade into three different types. Then again this is a very general statement. Of course we can select what different metal if we are making our own machete. Main advantage of stainless steel blade is it resistant to rust. An essential consideration if our working close to saltwater. Unfortunately the metal is softer than carbon steel. So it needs regular sharpening. The biggest disadvantages of stainless steel blade is the cost of materials. Stainless steel is more expensive than carbon steel. We can expect a higher price for the end product. Carbon steel is fairly common as the cost of production is fairly low and the process of making the machete blade is less complex. Majority of machetes for the mid and low end market are made of carbon steel. You got what you pay. But there is nothing wrong with that. Carbon steel is much harder than stainless steel. It can provide sharp blade with simple maintenance. And it don’t require regular sharpening, unless we use it on daily basis. For general usage, simple sharpening and interval oiling is enough. Unfortunately the carbon steel is very vulnerable to rust, especially with the present of high moisture. Salty water will definitely make it worse. The best way to avoid the rust is to oiled the blade regularly. High carbon steel provides the best characteristic of both carbon steel and stainless steel. The metal is the combination of both carbon steel and stainless steel. It can withstand corrosion much better than carbon steel. And it is much durable than stainless steel. Obviously the process of making high carbon steel is more complex and expensive. The metal also is less tolerance to high heat. You bought a machete and are ready to use it, but only then realize the machete needs to be sharpened. At Best Machete, we will share with you’re the necessary knowledge about the best sharping information. So your machete will be well prepared for the works. There are different ways of sharpening machetes, depending on the purposes. Sharpening a machete for cutting small woods will be very much different than for slicing meat. Here are some general guide on the machete blade angle. For a non woody vegetation cut small sharpening angles about 20-25 degrees are the best , razor sharpness is necessary to cut grass, with this kind of sharpening there is little risk of chipping the edge. So it is ok to have smaller blade angle. For a woody vegetation or branches cut a larger sharpening angle is recommended, 25-35 degrees. The large angle provide extra strength when cutting through the strong materials. This way the blade can withstand the constant beating of strokes while chopping. For general usage machete with 25-30 degrees angle blade will be suitable. it can cut through most materials with ease, without compromising the strength of the blade. One good example is machete use for camping. Having share that let us look at the list of machete sharpeners. These ones are used to put an edge on a new blade as well as a damaged blade. Its main purpose is to give the machete the required blade angle. The result will be rough, so it needs to be sharpened further with a finer sharpener. 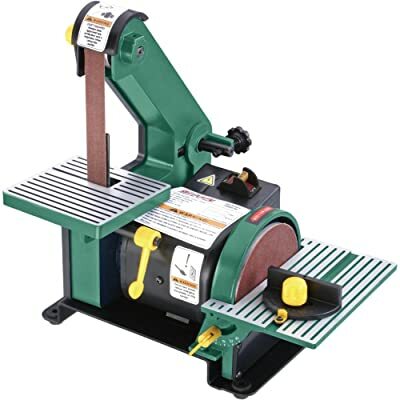 Heavy sharpeners include belt sanders, grinding wheels and mil files/hones. Let see what each got to offer. This is the easiest and most cost effective method of sharpening machetes. Especially if you have many blade that need to be sharpened. The belt senders can create a convex edge using the inner part of the belt. It is very important not to monitor the blade temperature. Just make sure to keep the blade temperature low. Otherwise the heat will weaken the metal. Grinding wheels is cheap. The price varies but you can buy one for about $50 dollars. 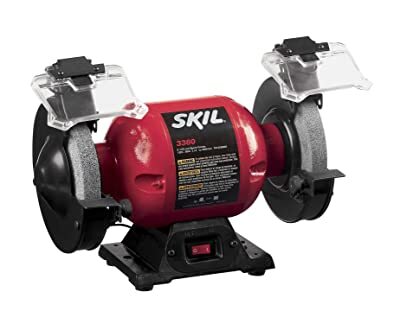 One good example is skil bench grinder. 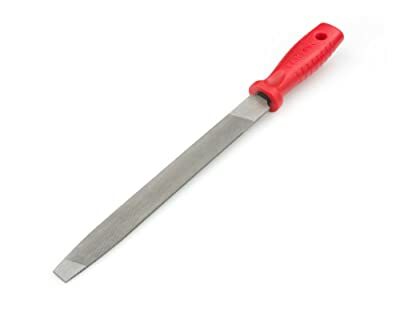 Beside sharpening machete, it can be used to sharpen all kinds of garden tools, mower blades and other implements. For experienced users, the use of a grinding wheel is perfect to remove initial bluntness from the machete. Grinding wheels are a more aggressive method to sharpen the blade and are recommended as a good option for initial sharpening, as they remove large nicks or restore a rusty or worn machete. The key to get a good sharpening is to set up a work area with enough space, so the entire length of the machete or tools could be drawn across the wheel in a smooth motion to create an even edge. Be careful not blocking the path between the blade and the grinding wheel. If you have enough experience using a grinding wheel this is the right choice for you. Again heat from the grinding can generate a very high temperature, just make sure your blade not overheat. The best way is to have a break in between. Alternatively we can also use water to cool down the blade temperature. Mill Files or hones are the least expensive option we have. They are easy to use and can be stored easily without requiring much extra space. Mill files have teeth that can give good blade profile. There are many files with double cut on one side and single cut for the other site. The double cut will give the blade a rough surface, the single cut on the other hand will give a finer finishing. We need to make sure our machete blade properly secured at a correct angle and held firmly in a vice. Mill file should be pushed over the blade (do not pull), and this need to be done repeatedly. Until we have a sharp blade. Conversely the blade can be drawn across the secured mill file. If you are in the field, an alternative is to stuck the machete in a tree trunk for filing it. We need to sharpen both sides of the blade. So do one side, then turn it over and sharpen the other side. However some military style machetes have chisel grind blades that are only sharpened only by one side. During the grinding process a thin projection of metal is created (we call this a burr), turn the blade over and carefully look for this burr, it can be on either side, as you sharpen the other side of the blade a burr can develop. It looks like metal shavings clinging onto the edge. To get a fine edge, all burrs must have been removed. While working in field, sharpening may be necessary. Our field sharpener can provide a touch up sharpening to our machete, as opposed to sharpeners that we have mentioned earlier. These files are not recommended to use as a primary grinding device, but they do a good work honing and polishing the edge. 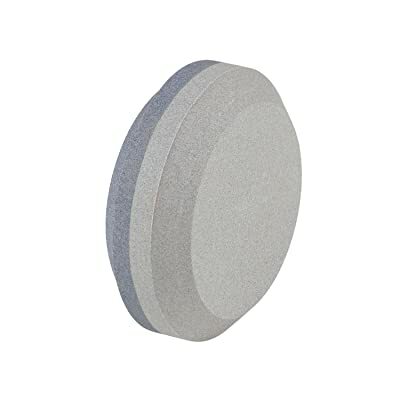 Different field sharpening stones are available for us, these stones can be kept in our pocket. In most cases the field sharpeners can be used without the need to use any oil or other cooling medium. Two of good example are The Puck and the traditional canoe file. The Puck is designed for large blades as machetes or mower blades, The Puck style Stone has a curved surface that is excellent for sharpening sickles and curved blades. Beside the traditional method, there are also a more modern field sharpeners. They are easy to use. 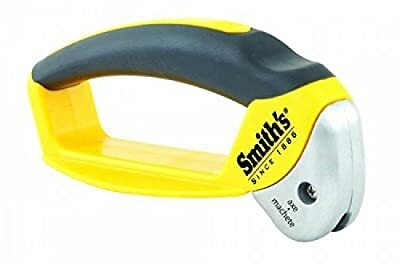 One good example is Smith’s 50118 Axe and Machete Sharpener. We really hope this short explanation about machete sharpeners provide you with enough knowledge on the options that are available. It is not a rocket science. It just need a little knowledge plug some common sense.